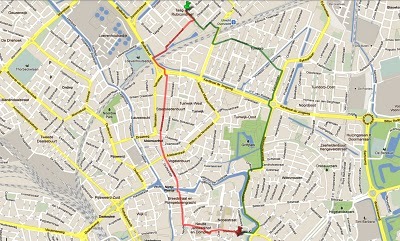 So my parents planned a route around the city centre and along busy streets. That last bit may seem odd but it isn’t. In the 1970s traffic calming was not common yet, but the busy main streets outside city centres did have separated cycle paths or lanes and my parents wanted me to be on those. So we had spent several Sundays trial riding the route together. I had to prove I knew the route well and they were also monitoring my behaviour around traffic carefully. Giving me hints and tips. I have cycled unsupervised from then on. With but one exception. One afternoon my mother suddenly showed up with the family car, worried by the first Autumn storm with heavy rain and wind. Right in front of the school, she put my bicycle in the trunk of the car to drive me home. It was with the best intentions but all my class mates were laughing and I urged my mother never to embarrass me like that again. She didn’t. I hadn’t seen my old home for years, but recently I rode the route again. Not much had changed! The biggest difference was that a level rail road crossing was now a tunnel. But apart from that little else has changed. Some of the infrastructure seemed old fashioned and one junction is clearly not up to present standards. Riding along the busier streets and on old fashioned cycle lanes is unpleasant. You couldn’t call the route dangerous, but you can argue if this is still the best route to take. That route also meant I had to take a detour. So after some time I rebelled and started following a shorter route right through the city centre. It meant negotiating with heavy traffic, smelly buses that took your breath away in narrow streets that also were full of cars and trucks. Motorised traffic was more often standing still than driving. I decided to ride that route again too. And surprise: almost everything in the city centre has changed! Routes to school. In green the longer and safer route in 1977, mostly following main arterial roads since they already had cycle provisions. The red and more direct route stays well away from arterial roads and is now more pleasant since it goes through an area of the city that has been mostly closed to motorised through traffic since 1977. Link to a google map with these routes. What is your average speed, assuming you are not filming unless you strap the camera to your forehead (no helmetcam for you)? 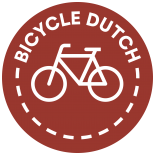 This entry was posted on 29 September 2011 by Bicycle Dutch in Original posts and tagged history, school, Utrecht.